"On the Second Day of Zentangle . . ."
Alfie holds a black tile as he sits on a pomegranate. To embrace what is worth holding dear." R and M progressed, black tangled white . . .
For years we explored the patterned beauty of black ink on the white square tile. This new art form continued to grow and develop through creative minds all over the world. We started looking at new and fun ways to continue our exploration of tangles. We were not ready to introduce color, but what about using white ink on black paper? We went to work immediately on our new idea and soon our home/studio/office was a symphony of black pieces of paper covered with white tangles. This reversal of roles opened up a whole new way to look at tangles. In June of 2011, after much searching for the right paper and pens, we unveiled our first Black Zentangle Tile. We cut the rich, black 100% cotton mould made paper from the same die as our white tiles. We chose a Sakura® Gelly Roll white gel pen and buttery smooth white charcoal pencil from General Pencil to illuminate this beautiful new paper. At first we assumed this reversal in roles of the traditional tangling materials would be exactly the opposite, but to our surprise it opened a whole new world of opportunity and discovery. Tangling on a dark surface was uncharted territory and we realized we were seeing old tangles in a a new light. To see some recent explorations on black tile tangling enjoy the video tutorials from Project Pack #01. Today we have a fun lesson using both black tile tangling combined with some white tile tangling. I never thought of cutting a hole in the tile! What a unique way to make this creation! Love it! So Stunning! I haven’t had a chance to use the black tiles yet. I love how you combine them! How cool is this? Cutting and pasting is out of my comfort zone, but oh boy, when you dare to go out of there you walk right into the magic! Love this excercise. 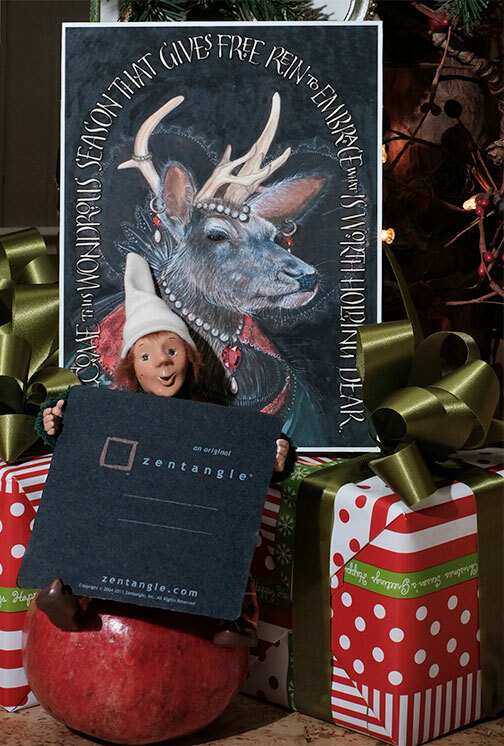 Thank you Rick, Maria and Zentangle team. I love the 3D effect and Renaissance colors so much that I have made nine of these (so far) to give as gifts! Thanks for the idea. I find the 3D aspect very pleasing and satisfying to the creative spirit! I loved doing this tangle. It fits right in with my crafty nature!!! Combining the two tiles is a wonderful idea. Never thought of doing a project in 3D! Thanks for the inspiration. This was a first for me. I loved the 3D tiles! Thank you! wow, such a surprising idea! Such a beautiful idea to combine two tiles to this perfect 3D object. You make me be an artist! Thanks a lot! The 12 days last year was such fun I wondered how you would top it. You come up with the most clever Iraq’s. Thanks. I’d hoped to join in with the tangling each day, but time sadly isn’t allowing at the moment. However I’m loving watching the videos in rare restful moments, and couldn’t resist making a tiny black Bijou today mirroring your frame tile! Very soothing and such fun new ideas. Loved every minute. Best of all I am ready to repeat the very same tangling project. I love how one does not need a lot of new tangles to experience something so new. The dimension and depth of this is amazing! Thanks for sharing. Look forward to these every year. This was so much fun. I can’t wait to try some different tangles using this format. Great fun this one is! Can’t wait to try this out. I’m loving these videos! I have always liked that Zentangle us a family affair, and in turn, we all have become one big artistic family, comprised of artists from all over the world. I’m glad I’m a part of this.